NYE has produced a number of miracles in its time, but none have been more inconceivable than the defiance and utter disregard Travis Head showed the Sixers bowling attack. Sean Abbot’s New Years resolution now pertains more to one of the 10 commandments – thou shall not bowl in the death overs. The sixers seemingly had the game won with 4 overs remaining. The 46,000 strong crowd condemned to a dull roar. At least that was until Travis Head’s masterful array of T20 stroke play confounded the record-breaking crowd in a display that put on more of a show than the premature fireworks. When Travis Head strode to the wicket, the Strikers were in a position of relative dominance. Simmons fleeting stint at the crease got the Strikers off to a brisk start, before the cagey Jayawardene played a stroke that would have been more at home on a dusty Pallakele deck. Though, as key wickets continued to tumble through the middle overs, the game looked set for an early finish. As Abbott ran in to deliver the first ball of the 18th over, the Strikers still required 51, in 18 balls. A remote chance considering Head had hit the boundary just four times and was striking at only 118. The first four balls of Abbott’s over went for 20, and Head seemed to conjure striking impetus. Abbott‘s predictable line and length saw him travel over the mid-wicket fence three times in four balls, squandering 27 vital runs. The experience of Bollinger delivered a tidy 19th over with a six off the fourth ball the only significant damage. A bold move by the Sixers skipper saw Abbott trusted in delivering the final over. A modest 13 needed off 6 deliveries. As the first ball was flicked with ease over square leg for six, Head needing 11 to deliver his first BBL century, the Strikers were destined to end 2015 in the top four. Two more short balls from Abbott were hooked over square leg for six. Head finally becoming the first Striker to make a BBL ton in its 5th edition. Pandemonium ensued. What a way to usher in the New Year – 2016, we can’t wait! Alex Hales looks odds on to take his place alongside captain Cook at the top of the mercurial English top order on Boxing Day despite underwhelming warm-up game form. The ECB have an ineluctable wish this Christmas – find an opening partner for Cook. The cricketing public could be forgiven for thinking the English selectors are attempting to stage a cricket version of the Bachelor. Since the egress of Strauss in 2012, the England captain has been through 8 divorces. Compton (twice), Root, Carberry, Robson, Trott, Lyth and Ali have all been shoved into the opening spot on the ill-conceived volition of selectors. The inclusion of Adam Lyth into the squad for the recently completed Ashes series seemed to be without substantiation, a wing and a prayer selection based on a lack or exhaustion of options. His performances exhibited England’s great deficiency and signaled a crisis seldom discussed by selectors – the epigrammatic life span of cooks opening partners. The most successful partner post Strauss is a man who is in contention to feature in the First Test on Boxing Day. Ironically, he was also the first to fill the Strauss void – and he didn’t make a hash of it. In fact, he and Cook have been the most prolific opening pair since Strauss’s departure, superseding the short-lived liaison with Michael Vaughan in 2007/08. In 17 innings, Cook and Compton managed 927 runs at 57.93. To supplement these already laudable statistics, their time together was during two series victories away from home. Compton may have overplayed his hand though. After being dropped in 2013, Compton has plied his trade in division one of the championship for Middlesex with resounding success. In 2014 he averaged 43.68 for Somerset before returning to Middlesex in 2015 where he averaged 38.72. Statistics that put him within the top echelon of talent going round the English domestic scene. To further Compton’s case, he has the potential to remedy England’s biggest problem – their routine dependence on the middle order – Root, Barstow and formerly Bell. Since his first stint, Compton’s successors have been frail, to say the least, in seeing off the new ball. Just three century stands have been had between Cook and his opening partner in 55 innings since Compton. In 17 innings together, he and Cook managed the same amount. 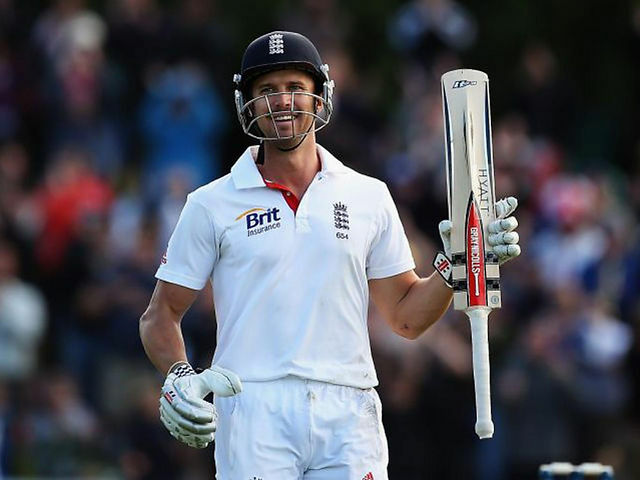 The first time round – Nick Compton celebrates his first Test Match ton. Picture Copyright Getty Images. Despite the fact he will likely feature on Boxing Day, he will doubtingly recuperate his relationship with his ex. Having burnt through eight openers in three years England turns to the services of Alex Hales, whose presence in the shorter form setups has been habitual yet chiefly unproductive. In 23 ODI innings, Hales averages a modest 25.17 having scored only a single hundred. His statistics aren’t flattering, yet his gung-ho approach to batting may well compliment the English top order. Cook and Root are technicians of the game whose performances flourish off the accumulation of singles. If Hales does face the new ball come the first morning in Durban, his incessant boundary hitting will relieve some of the pressure that has accompanied Cook for the past three years. An attribute that will bode well with selectors for future series. He wouldn’t be the first T20 connoisseur to chance his hand at the longer form and succeed – case in point – David Warner (4305 runs at 50.64). With South Africa in a relative state of flux after their derailment in India, England can pounce on the half eaten carcass and produce a thrilling series victory away from home. Early expectations of this series predict one that will be defined by the small battles; Amla v Cook, du Plessis v Root. Two men that have played a starring role for South Africa over the past several years, Steyn and de Villiers, stand between England and a series victory. If England take India’s lead and contain de Villiers, the trophy may well be travelling cross-country back to England. September 1st 2011 – Galle. The obsessive scouring of the domestic competition to find a new spin king had long turned into a game of roulette for Australian selectors. After continued unsuccessful attempts in the form of McGain, Beer and Hauritz (to name a few), the wheel landed on a young, unknown curator from Adelaide. Another potential winner. He becomes the 11th spinner to be tested since the departure of the irreplaceable Shane Keith Warne 5 years earlier. As he comes onto bowl in the 15th over, a brand new baggy green cap proudly hoisted atop his head, he is faced with the task of bowling to Sri Lankan maestro Kumar Sangakkara, who had recently amassed 184 runs in a three match tour of England. In an attempt to repay his skippers boat of confidence, he tosses the ball up outside off-stump, drawing Sangakkara forward to take his outside edge which, fittingly, finds its way to the dependable hands of Michael Clarke in 1st slip. He follows it up with a further 4 high-profile Sri Lankan wickets to grab a five-fa on debut, a sign of the heights he is to reach across the next 49 test matches of his esteemed career. December 9 2011, Hobart. The final game of the Trans-Tasman trophy was more than just a crushing victory for Australia, it was the defining moment for Nathan Lyon as a cricketer, and, most importantly, a person. Playing just his 7th match as the 421st Australian player to pull on the baggy green, Lyon was faced with his biggest adversity yet. With the Australians needing a further 42 runs to win the test match and secure the Trans-Tasman trophy, a sanguine Nathan Lyon strides to the wicket alongside the untapped batting talent of David Warner, who has made his way to a maiden hundred in just his second test. With 7 runs left to get, his innings ends. Bowled by Bracewell for 9. It was the first real adversity Lyon had to overcome in the baggy green. It taught him the most important virtue necessary for success at test level – perseverance. The Ashes 2013-14. Playing second fiddle to in-form Mitch Johnson in a series dominated and defined by searing pace, Nathan Lyon managed 19 wickets at 29.26. He revitalized round the wicket bowling, taking the prized scalps of Bell, Prior and Bairstow in an aptly devised leg side trap. A scheme that has provided a bountiful supply of international wickets and will surely be etched into Nathan Lyon folklore. While the effect Lyon had on this series will be largely overlooked, his partnership with Harris and Johnson was crucial in delivering a clean sweep of a one-sided Ashes series. Nathan Lyon’s great strength, the key to the constant evolution of his career and his innate ability to shift gears, is a virtue that is greatly lacking amongst many dressing rooms around the globe – resilience. You haven’t, and perhaps will never again, see a player who lives and breathes the baggy green culture the way he does. His performance thrives off it. As he walks off the ground in Hobart against the West Indies, he will join a club that, to Australian cricket, has about as many members as the lunar landing module of Apollo 11. Only the great Hugh Trumble (421 wickets) comes close. Though Lyons career will not be celebrated in a myriad of champagne showers come its completion, he will have had a pivotal role to play in the outcome of a number of Australia’s great victories. The last time the West Indies toured Australia for a test series, Kevin Rudd was the incumbent of the nations top job (for the first time), the #hashtag twitter phenomenon hadn’t yet taken off and the West Indies were ranked a miserly 8th on the ICC Test Rankings. The year was 2009. Since, the cricketing world has seen stars born, heroes’ made, ashes won and, to the disheartening detriment of West Indies cricket, the prominent emergence of franchise based competitions. It should serve as no surprise they haven’t been back since. Cricketing talent within the West Indies has stagnated at the hands of an incompetent board. Their inadequacy has triggered ‘world-beaters’, Gale, Bravo and Sammy, to pursue a more lucrative, viable career in T20 cricket. And who can blame them. Once again the Windies land on Australian soil ranked 8th in the ICC test rankings, just above Bangladesh and Zimbabwe, with an overwhelming expectation of failure from an unheralded, unpropitious 15 man squad. Cricket has never witnessed such a colossal fall from grace. Since its tantalizing, sumptuous pace went missing in the mid 2000’s, cricket has been largely void of a positive West Indian presence in the headlines. But that’s not to say an ‘inferior’ West Indies lineup can’t make inroads on Australian wickets. The West Indies lineup boasts two of the world’s premier fast bowlers, Jerome Taylor and Kemar Roach. If early indications of a green wicket in Hobart do come to fruition, Taylor and Roach could have Australia’s brittle middle order in some trouble with a swinging ball. Knock off the top three, and all of a sudden their bowling to a guy who’s loitering on the edge of replacement and two brothers who are battling to keep their test careers alive. Although their batsmen seem to take an equivocal approach to batting at times, there’s serious potential for them to take advantage of a somewhat underprepared Australian bowling lineup. The absence of Mitch Johnson through retirement and Mitch Starc through injury has reduced Australia’s potency with the new ball. If relatively established test cricketers Darren Bravo and Marlon Samuels, who hold reputable averages of 40.91 and 34.82 respectively, can spend long periods at the crease, they may come close to drawing a test. For the West Indies, it’s a combination of application and a happy-go-lucky approach where their batting thrives. If we don’t see this during the series, the West Indies may well float further up the proverbial creek without a paddle. This tour will not so much be about the West Indies winning matches, but rather winning back the respect of the cricketing public with improved results on the field. The West Indies may be able to live without cricket, but cricket certainly cannot live without the West Indies.